Ben's Bombers of the Victoria Senior League dropped their opening game of the season, then won 20 straight before dropping the league championship series to the underdog Navy nine. 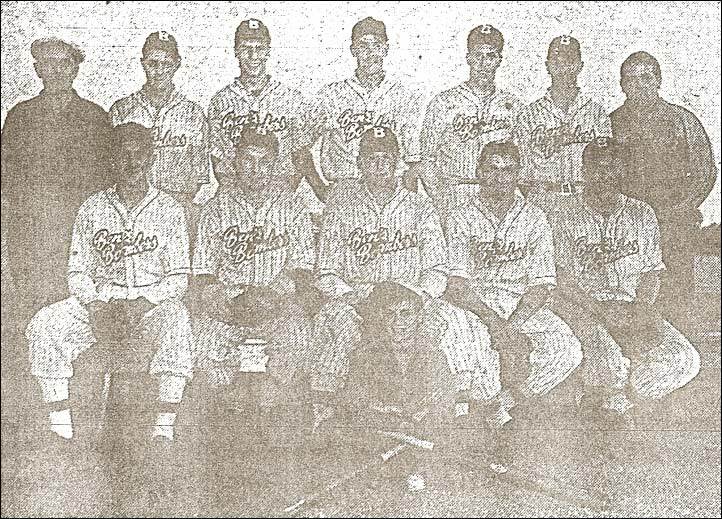 Back row (left to right) - Percy Ross Trainer, Jack Walker, Ron Castner, Bill Prior, Rookie Wright, Al Duz, Bob Weigand Manager. Front row - Roger Ross, Denny Fawcett, Frank Scroggs, Mickey Smith, Earl Phillips. Bat boy is Ronny Thornthwaite. Missing - Wally Thomson, Al Leatham and Ray Moretti.